Abstract: A total of 36 roasted peanut samples were collected from 12 regions at 4 Egyptian governorates (Cairo, Giza, Alexandria and El-Faiyum) during 2017. Aflatoxins (B1, B2, G1 and G2), ochratoxin A and zearalenone were determined in the collected samples using HPLC. Seventy five percent of samples were contaminated with aflatoxins. Aflatoxin B1 was the most dominant type, whereas aflatoxin G2 was found only in two samples at low levels. Samples were completely ochratoxin A and zearalenone-free. Quantitative results revealed that the samples of Al-Manshieh region at Alexandria governorate had the highest averages of aflatoxins B1, B2 and G2 (33.15, 3.66 and 0.22 µgkg-1, respectively), while Al-Ajami samples at the same governorate had the highest average of aflatoxin G1 as 2.83 µgkg-1. Likewise, samples from Dokki at Giza governorate had high levels of total aflatoxins recording 26.33 µgkg-1. Regarding to the effect of gamma radiation on aflatoxin B1, the doses of 5, 10 and 20 kGy were studied. The reduction levels of aflatoxin B1 varied according to the spiking levels and dose of gamma radiation. The dose 5 KGy was ineffective, whereas, a significant reduction in AFB1 was noticed using 10 and 20KGy recording >26.7% reduction notably in samples spiked with 20 µgkg-1 AFB1 and treated with 20 KGy (59% reduction). A total of 36 roasted peanut samples were collected from 12 regions at 4 Egyptian governorates (Cairo, Giza, Alexandria and El-Faiyum) during 2017. Aflatoxins (B1, B2, G1 and G2), ochratoxin A and zearalenone were determined in the collected samples using HPLC. Seventy five percent of samples were contaminated with aflatoxins. Aflatoxin B1 was the most dominant type, whereas aflatoxin G2 was found only in two samples at low levels. Samples were completely ochratoxin A and zearalenone-free. Quantitative results revealed that the samples of Al-Manshieh region at Alexandria governorate had the highest averages of aflatoxins B1, B2 and G2 (33.15, 3.66 and 0.22 µgkg-1, respectively), while Al-Ajami samples at the same governorate had the highest average of aflatoxin G1 as 2.83 µgkg-1. Likewise, samples from Dokki at Giza governorate had high levels of total aflatoxins recording 26.33 µgkg-1. Regarding to the effect of gamma radiation on aflatoxin B1, the doses of 5, 10 and 20 kGy were studied. The reduction levels of aflatoxin B1 varied according to the spiking levels and dose of gamma radiation. The dose 5 KGy was ineffective, whereas, a significant reduction in AFB1 was noticed using 10 and 20KGy recording >26.7% reduction notably in samples spiked with 20 µgkg-1 AFB1 and treated with 20 KGy (59% reduction). The peanuts are strategic crops in Egypt, where the cultivated area is 0.06 million hectares and the productivity is 0.21 million tons (3.2 tons/hectares) according to USDA (2018). Also, it considers one of the major exporting countries recording 57 million USD (Comtrade, 2017). Contamination of peanut by aflatoxin producing fungi is the major hazards during agriculture, harvesting, storage and marketing (El-Shanshoury et al., 2014). Therefore, the maximum levels <4 µgkg-1 total aflatoxins and <2 µgkg-1 AFB1 in peanuts was established (European Commission, 2006).Aflatoxins are toxic secondary metabolites of Aspergillus flavus and Aspergillus parasiticus that contaminate human food especially peanut. They are known as mutagens, carcinogens, genotoxics and carcinogens that have healthy serious for animals and humans. Aflatoxin B1 is the most toxic one among aflatoxin types and is classified as carcinogenic compound group I (IARC 1993). Abdel-Wahhab et al., (2011) reported that peanut is suitable substrates for aflatoxin production by Aspergillus members. They noticed that, the levels of aflatoxin B1 and B2 in peanut samples were 10.07 and 0.46ngg-1, respectively. Also, El-Gohary (1995) determined the aflatoxin levels in some foodstuffs collected from Alexandria. He reported that, about 7.5% of peanut samples were contaminated by aflatoxins. In another study, 14 out 60 of Egyptian peanuts samples (23.3%) were contaminated with different mycotoxins such as aflatoxins, ochratoxins, sterigmatocystin and zearalenone(Youssef et al., 2008). Although, Sultan and Magan (2010) found no ochratoxin A in tested peanut samples, they found that 5 of 12 Aspergillus section Circumdati isolates were ochratoxigenic referring to the potential contamination with ochratoxin A. The radiation is an effective technique for preserving food against aflatoxins contamination. So, reduction of aflatoxins is important to ensure that contamination levels are kept or below the limits of national and international Public Health Authorities. In this respect, Kanapitsas et al., (2015) studied the effect of gamma radiation (10 kGy) on aflatoxin B1. They found that the aflatoxin B1 was reduced from 7.02 to 4.97 ngg-1recording 29% reduction. The efficiency of radiation process is depending on many factors such as radiation dose, moisture content, mycotoxin type, mycotoxin concentration and the presence of matrix components (Calado et al., 2014). The present study was designed to estimate the update levels of mycotoxins i.e. aflatoxins (B1, B2, G1 and G2), ochratoxin A and zearalenone in roasted peanuts samples collected from Egyptian markets. Using gamma radiation in the reduction of the dominant contaminated mycotoxin was also investigated in this study. In triplicates, roasted peanut samples (1 kg each) were collected from 12 regions at 4 Egyptian governorates during 2017: Cairo (Helwan, Al-Maadi, Al-Shuruq), Giza (Al-Omraniyah, Dokki, Atfih), Alexandria (Al-Manshieh, Abu-Qir, Al-Ajami) and El-Faiyum (Sinnures, Ibshway, Etsa). Control peanut sample, free aflatoxins, were grinded and spiked with AFB1 at three levels as low concentration (2µgkg-1), moderate concentration (10µgkg-1) and high concentration (20µgkg-1). The spiked samples were irradiated in transparent bags (50g each treatment) with gamma radiation at different doses (0, 5, 10 and 20 kGy) at room temperature (25ºC) in the National Center for Radiation Research and Technology (NCRRT), Cairo, Egypt. The irradiation was performed using a cobalt-60 γ-source irradiator with dose rate of ~ 2.77 kGyh-1. 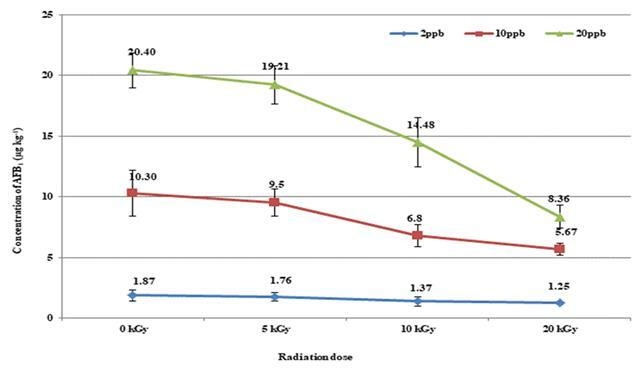 The irradiation were calibrated by the National Physical Laboratory using the dichromate dosimetry system (Aziz and Moussa, 2004; Alkhalifah et al., 2013). Aflatoxin B1 was extracted and determined in the irradiated samples. The extraction and cleanup of aflatoxins (AFS) from collected and irradiated samples were performed according to CB method (AOAC, 2016a). The final extracts were derivatized using 200 µl hexane, 50 µl trifluoroacetic acid (TFA) and then mixed well by vortex for 30 sec. The mixture was left to stand for 5 min. A mixture of 0.95 ml H2O: CH3CN (9:1 v/v) was added and mixed well for 30 sec. After 10 min, the upper layer was discarded preparing for HPLC analysis. Three replicates of peanut samples of each treatment were analyzed for AFs. The HPLC system used for determination was Ultimate 3000 Thermo Fisher system (Germany) equipped with auto sampler pump, fluorescence detector model: UV/Vies and a C18 column chromatography Phenomenex (250 x 4.6 mm, 5 μm). The mobile phase was methanol/water/acetonitrile (30:60:10, v/v/v) using an isocratic flow rate of 1 ml min-1 at 360 nm excitation and 440 nm emission wavelengths. Ochratoxin A (OTA) was determined according to AOAC (2016b). Fifty grams of grinded peanut was blended with 25 mL 0.1M phosphoric acid and 250 ml chloroform for 3 min at medium speed. Ten gram of diatomaceous earth was added near end of blending. Mixture was filtered and 50 ml was collected for cleanup. To the separatory funnel, 10 ml 3% sodium bicarbonate was shaked gently with the 50 ml portion. Five milliliter of the bicarbonate layer was passed throw conditioned C18 column (with 2 ml methanol, 2 mL water, and 2 ml3% sodium bicarbonate) followed with 2 ml0.1M phosphoric acid, then 2 mlH2O. OTA was eluted with 8 ml ethyl acetate-methanol-acetic acid (95 + 5 + 0.5) into 10 ml test tube or vial containing 2 ml water. The upper layer was collected and the remaining layer was rinsed twice with 1 ml ethyl acetate and added to OTA extract. The extract was evaporated just to dryness on steam bath under N. Samples were dissolved in mobile phase and analyzed with HPLC as mention in aflatoxin analysis using acetonitrile/water/acetic (99:99:2, v/v/v) isocratically at 1 ml min-1 flow rate and at 333 nm excitation and 460 nm emission wavelengths. Five grams of ground peanut sample were placed in 50 ml falcon tub and then 10 ml water was added. The tube was shaked and 10 ml acetonitrile was added and the tube was reshaked .Then the mixture (6 g MgSO4 + 1.5g NaCl) was added. The tube was shaked and centrifuged at 4000 rpm for 5 min .The supernatant was collected into 15 ml tube containing (1 g MgSO4 + 0.2 g Primary Secondary Amine (PSA) and shaked for 1 min then centrifuged. For zearalenone (ZEA) determination, a volume of 4 ml from the supernatant was evaporated using rotary evaporator then diluted with 2 ml mobile phase and analyzed by HPLC. Same previous HPLC system was used. Samples were analyzed using acetonitrile: water (50:50 v/v) at 274 nm excitation and 410 nm emission (Sebaei et al., 2012). Data on the AFs contamination in collected peanut samples and effect of gamma radiation were analyzed using Statistic Version 10 (State Soft, Tulsa, OK, USA). The means of AFs concentrations were compared using analysis of variance (ANOVA, one way analyses) (P<0.05). Fisher’s LSD method (α=0.05) was applied to compare differences between treatments. The levels of roasted peanuts contamination with mycotoxins are illustrated in Table 1. All peanut samples collected from different Egyptian governorates were completely ochratoxin A and zearalenone-free. These results are disagreement with those noticed by Youssef et al. (2008) who revealed that the contamination ratio by ochratoxin A and zearalenone in peanut samples were 5% of each. The presence of ochratoxin A and zearalenone in peanut samples return to dominant fungal genera associated with peanut from the farm to the roast process. Ochratoxin A is mainly produced by Aspergillus ochraceus, A. carbonarius, A. niger and other species of Penicillium (Wagachaand Muthomi, 2008). While, zearalenone produced by Fusarium species such as F. oxysporum, F. sporotrichioides and F. sulphureum (Kumar et al., 2008). So, undetectable levels of ochratoxin A and zearalenone in the tested peanut samples may be return to absence of producer fungi for the two toxins. Peanut is an important substrate for the growth and aflatoxin production by different species of Aspergillus. Regarding to the levels of aflatoxins in peanut samples (Table 1), Aflatoxin B1 was the dominants type which found in 75% of samples followed by AFB2 (58%), then AFG1 (50%) . AFG2 was noticed just in 2 samples (17%). In general, Cairo governorate showed the lowest contamination with AFs, whereas Alexandria had the highest contaminated peanut samples recording 38.93 µgkg-1 ­of total aflatoxins in Al-Manshieh region. Increase of aflatoxins contamination in Alexandria samples may be return to the highly humidity in the north of Egypt. This hypothesis is in agreement with Embaby and Abdel-Galel (2014) who reported that the contamination fungi-produced aflatoxins in peanut samples of El-Behera governorate (north) were higher than peanut samples of Aswan governorate (south). Results indicated also that 25% of peanut samples were exceeded the permissible limits of Egyptian standard (1990) as 5 and 10 µg kg-1 for AFB1 and total aflatoxin, respectively. Meanwhile, 42 and 33 % of peanut samples were higher than maximum residual limits of AFB1 (2 µg kg-1) and total aflatoxin (4 µg kg-1), respectively according to the European Commission (2006). These results are nearly with El-Shanshoury et al. (2014) who determined the aflatoxins in Egyptian peanut (collected from central delta provinces) and reported that the ratios of positive samples were 100 and 37.5 (%) for AFB1 and AFG1, respectively. Also, these results coincide with those reported by Youssef et al. (2008) who reported that, the contamination ratios by aflatoxins (B1, B2, G1 and G2) in untreated and roasted peanut were 20 and 10 (%), respectively. Meanwhile, the contamination ratio by aflatoxins in other Egyptian peanut samples was 42.5 % (El-Maghraby and El-Maraghy, 1987). The levels of aflatoxins in this study are in accordance with Younis and Malik (2003) who recorded aflatoxins levels of Sudanese roasted peanut ranged between 4 and 12 µg kg-1. Meanwhile, the levels of aflatoxins in peanut samples of present study were less than those determined by El-Shanshoury et al. (2014) who reported that the levels of aflatoxins ranged from 210 to 600 µg kg-1 for AFB1 and from 250-400 µg kg-1 for AFG1. The high content of moisture in peanut can increase the levels of AFs as 10 fold during 3-day (Hell et al., 2008). Also, the common drying method for peanuts is sun drying that considered one of the ways to contamination by AFs (Santini et al., 2015). So, the variation in AFs concentrations of different samples may be returned to the moisture content of peanut samples or the contamination levels during the drying process. Also, the contamination extent of peanut samples by aflatoxins depends on the levels of A. flavus colonization in cultivated soil, moisture content and temperature of soil. Likewise, the contamination levels of peanut samples by aflatoxins may be increased during harvest stage, drying process and storage conditions. As well as, the levels of AFs in roasted peanuts depend on efficiency of roasting process. In this respect, Yazdanpanah et al. (2005) reported that the roasting process (150°C for 30 minutes) of contaminated peanuts can reduce the AFs levels. Also, Ozkarsli (2003) noticed that, the AFs levels of peanut was reduced by 48% after addition sodium chloride (50 g kg-1) during the roasting process. Table 1Concentrations of aflatoxins (µgkg-1) in peanut samples collected from different Egyptian governorates. Means followed by different subscripts within column are significantly different at the 5% level. Figs 1 and 2 show the effect of gamma radiation doses (0, 5, 10 and 20 kGy) on the reduction ratio of AFB1. Gamma radiation effect was studied only on AFB1 as prevalent form and the most potent of the other detected toxins i.e. AFG1, AFB2 and AFG2 (Kanapitsas et al., 2015). Control sample (aflatoxins-free) were spiked with AFB1 at three levels: low concentration (2µgkg-1), moderate concentration (10µgkg-1) and high concentration (20µgkg-1). The dose 5 kGy had the less effect on AFB1 reduction (<7.8%). The higher doses, 10 and 20 kGy, significantly decreased AFB1 in peanut samples at all spiking levels (26.7-59.0% reduction). The reduction ratios were increased by increasing the concentration of aflatoxin B1 in spiked samples notably at the dose 20kGy. This finding is not in accordance with Hooshmand and Klopenstein, (1995) who found that the doses of gamma radiation up to 20 kGy did not affect AFB1 concentration in wheat, corn and soybeans. Meanwhile, Aziz and Youssef (2002) reported that, the AFB1 in peanut, corn and wheat was destructed completely at 20 kGy of gamma radiation. The quantity of particular radiolysis products after irradiation process will increase with irradiation dose (Skovgaard, 2000). Also, Calado et al. (2018) reported that the low mycotoxin will certainly be more protected from radiation effects than the high mycotoxin. These results are in agreement with Kanapitsas et al. (2015) who reported that the reduction ratio of AFB1 in spiked raisins samples was 29% after irradiation with 10 kGy. Also, Jalili et al. (2012) noticed that the reduction ratios of AFB1 in black and white pepper were increased with increase the irradiation doses from 5 to 30 kGy. There are no available studies mentioned the mechanism of aflatoxins degradation by gamma radiation. However that of ochratoxin A degradation was explained by Calado et al. (2018). They reported that, the moisture content is a major factor for ochratoxin A reduction by gamma radiation. The applied radiation dose (8.6 kGy) was suitable to accomplish a 98% reduction of the ochratoxin A dissolved in water (2.5 μmol L−1). But in the dried form, the same radiation dose eliminated just 12% of the ochratoxin A. They concluded that, the efficiency of gamma radiation was increased in the presence of water because water ionization (water radiolysis) which lead to creating the reactive species such as H2O2, H3O+, H˙, HO˙, HO2˙, OH− and H2. These reactive species are reactive against double bonds (aromatic or heterocyclic rings) and they initiate the hydrolysis of ochratoxin A. Figure 1 Effect of gamma radiation (KGy) on AFB1 content in spiked peanut samples. Figure 2 Reduction ratios of AFB1 in spiked peanut samples after gamma radiation. Roasted peanut samples were ochratoxin A and zearalenone free and contained aflatoxins notably AFB1 in 75% of the samples. Samples from Alexandria regions were highly contaminated with aflatoxins. Gamma radiation was an effective technique to reduce that contamination. Around 60% of AFB1 content in spiked samples was reduced using 20 KGy dose. This method is recommended to eliminate the AFB1 in contaminated peanut to the acceptable levels. Acknowledgements: This study has been supported by the National Research Centre in Egypt via the research project No. 11040303 (2016 – 2019). ABDEL-WAHHAB, M. A., SEHAB, A. F., HASSANIEN, F. R., EL-NEMRSH, E., AMRA, H. A., ABDEL-ALIM, H. A. 2011. Efficacy of ozone to reduce fungal spoilage and aflatoxin contamination in peanuts. International Journal of Nuts and Related Sciences, 2(4), 1-14. ALKHALIFAH, D. H. M., EL-SIDEEK, L., ELGAMMAL, M. H., ELSHERIF, M. H., ZAIED, S. A. F. 2013. Effect of gamma irradiation on microbiological analysis, acrylamide content of coffee beans with special references to genotoxicity. Journal of Applied Sciences Research, 9 (4), 3157-3166. AOAC.2016a. Official methods of analysis. Natural toxins,49.2.08, 20thedn., Chap. 49. 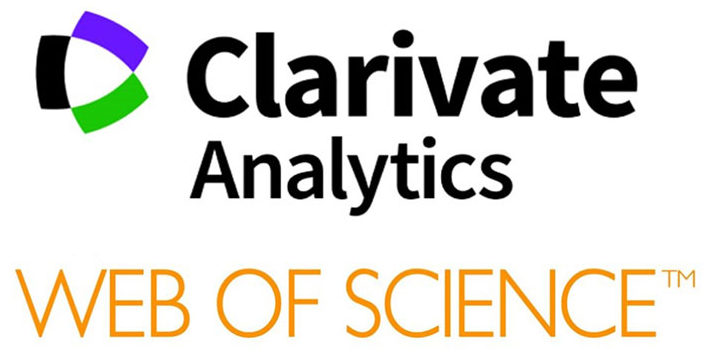 Association of Official Analytical Chemists, Maryland, USA. AOAC.2016b. Official methods of analysis. Natural toxins,49.6.03, 20thedn., Chap. 49. Association of Official Analytical Chemists, Maryland, USA. AZIZ, N. H., YOUSSEF, B. M. 2002. Inactivation of naturally occurring of mycotoxins in some Egyptian foods and agricultural commodities by gamma irradiation. Egyptian Journal of Food Science (Egypt). J. Food Sci., 30, 167-177. EGYPTIAN STANDARD, 1990. Maximum limits for mycotoxin in food. Egyptian Organization for standardization and quality control, part (1) aflatoxin. ES 1875-1990. EL-SHANSHOURY, A. R., EL-SABBAGH, S. M., EMARA, H. A., SABA, H. E. 2014. 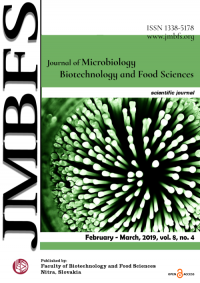 Occurrence of moulds, toxicogenic capability of Aspergillus flavus and levels of aflatoxins in maize, wheat, rice and peanut from markets in central delta provinces, Egypt. Int. J. Curr. Microbiol. App. Sci, 3(3), 852-865. EMBABY, E. M., ABDEL-GALEL, M. M. 2014. Detection of fungi and aflatoxins contaminated peanut samples (Arachishypogaea L.). Journal of Agricultural Technology, 10(2), 423-437. EUROPEAN COMMISSION, 2006. Final report of a mission carried out in China, in order to assess the facilities and measures in place for the control of aflatoxin contamination in peanuts intended for export into the EU. Report DG (SANCO)/8126/2006. OZKARSLI, M. 2003. Effect of traditional-roasting and microwave-roasting on aflatoxin B1 in peanuts. MSc Thesis, Cukurova University Institute of Natural and Applied Sciences, Adana, Turkey. SKOVGAARD, N. 2000. High-dose Irradiation: Wholesomeness of Food Irradiated with Doses above 10 kGy.-Report of a Joint FAO/IAEA/WHO Study Group. Technical report series, No. 890, 1999, vi+ 197 pages (available in English; French and Spanish in preparation). Paper back; WHO Marketing and Dissemination, 1211 Geneva 27, Switzerland; order no. 1100890. ISBN 92 4 120890 2; Sw. fr. 42.-/US $37.80. In developing countries: Sw. fr. 29.20. International Journal of Food Microbiology, 1(58), 130-131..
YOUNIS, Y. M., MALIK, K. M. 2003. TLC and HPLC assay of aflatoxin contamination in Sudanese peanuts and peanut products. Kuwait J. Sci. Eng., 30(1), 79-93.